Great fun to drive. 1.0 TSI engine is packed with character. High quality interior. Doesn't really do enough to justify its premium over the Up 1.0 TSI 90PS. Extremely noisy on the motorway. Production held up by WLTP. Production of Up GTI held up by WLTP. Long delivery dates into 2019 being quoted. 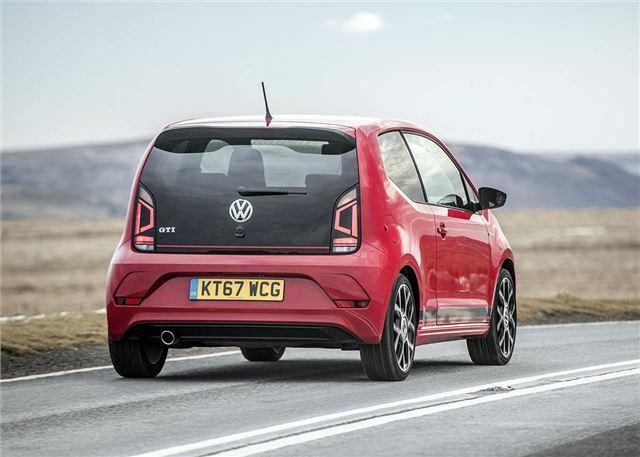 The Volkswagen Up GTI is the cheapest route into a hot hatch and provides genuine laugh out loud fun, thanks to its miniscule weight, playful handling and zesty turbocharged 1.0-litre engine. 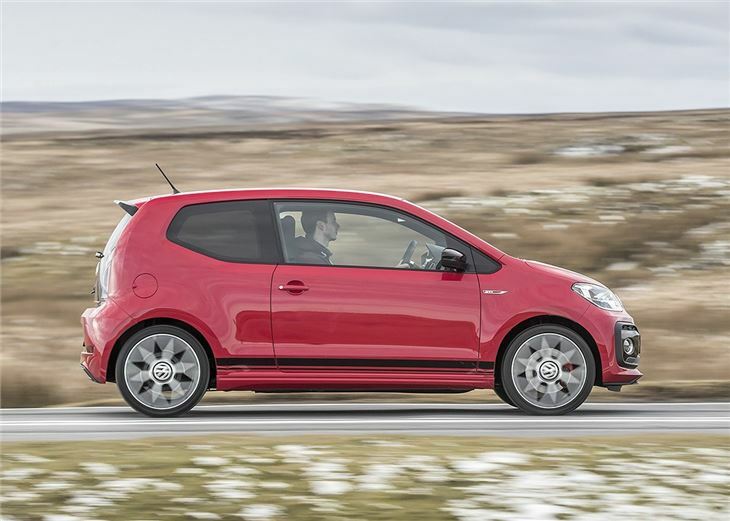 It might struggle to justify its price premium over the 90PS car, but the GTI is an entertaining throwback to the old school pocket rocket. 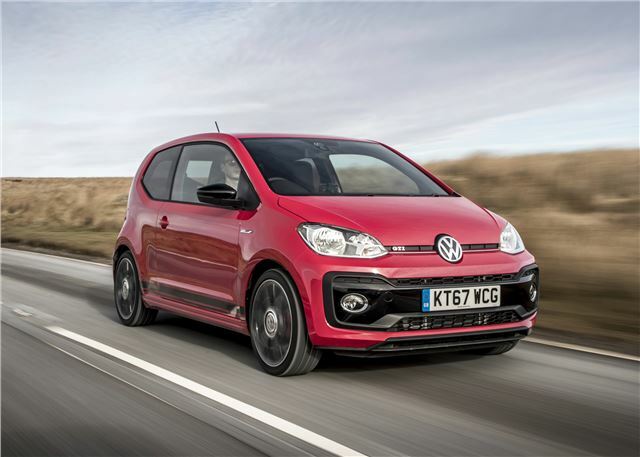 The Volkswagen Up GTI doesn't win any sports car power offs, with its turbocharged three-cylinder petrol engine mustering just 115PS and covering 0-62mph in a leisurely 8.8 seconds. However, with a kerb weight of 1070kg, the 1.0-litre unit's 200Nm of torque provides a powerful bump through all of the gears to give the impression you're travelling a lot faster than the speedo suggests. Indeed, point this mico machine at a twisty road and it’ll scamper round with the eagerness of a demented Bloodhound, with its burbling soundtrack emitting a deep growl as you drop a gear and accelerate hard out of a tight bend. There are some drawbacks, with the overly light steering and stumpy chassis making it quite hard to pinpoint the Up’s handling limits. Drivers expecting a razor sharp drive will undoubtedly be disappointed with the lack of feedback through the wheel and pedals. 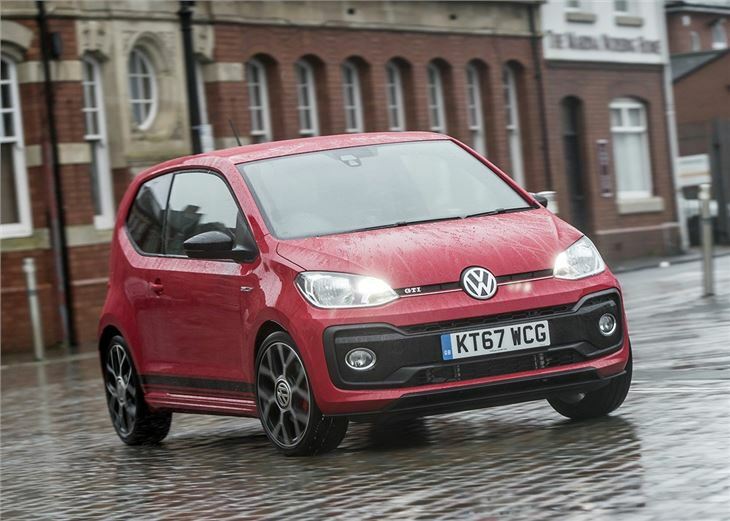 The front-wheel drive set-up has a tendency to get restless when presented with less than perfect road or weather conditions too, which places a nagging doubt about the Up’s suitability as a hot hatch. Most will not be bothered by the lack of F1-type precession and simply enjoy the fact that you can go pedal-to-the-metal without fear of clocking up triple digits on the speedo and a difficult conversation with members of the local constabulary. 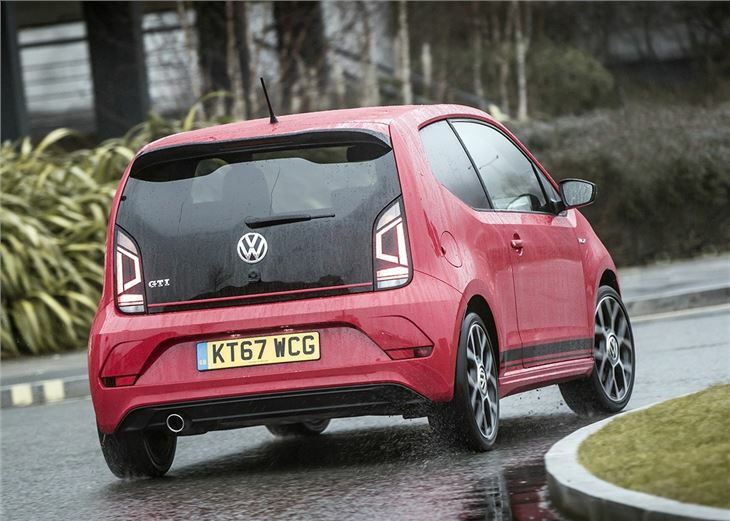 And for this end the Up GTI comes into its own, because it is fast car fun without the frivolous fast car figures. 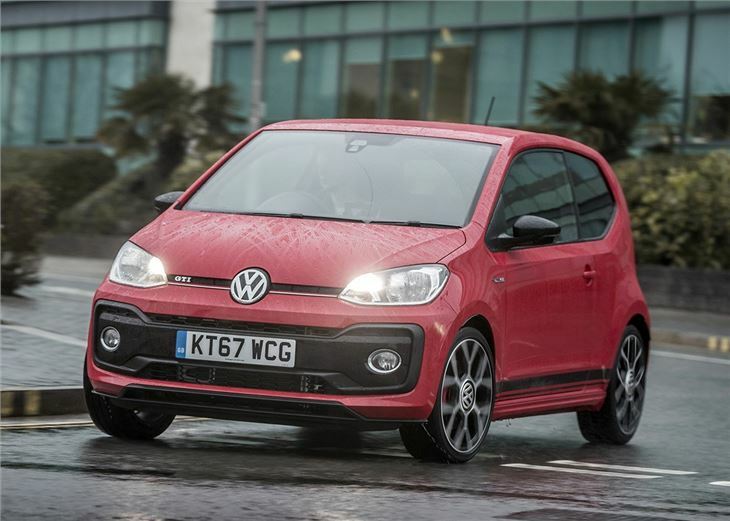 As with the standard car, the cabin is among the best of any city car on sale. The build quality is top notch and there is plenty of space for four adults to fit in comfort. The ride quality is on the firm side of comfortable and potholes provide an unwelcome wallop as the suspension crashes down heavily. The engine and wheels also generate quite a lot of noise on the motorway too, which some might find grating after an hour or two. 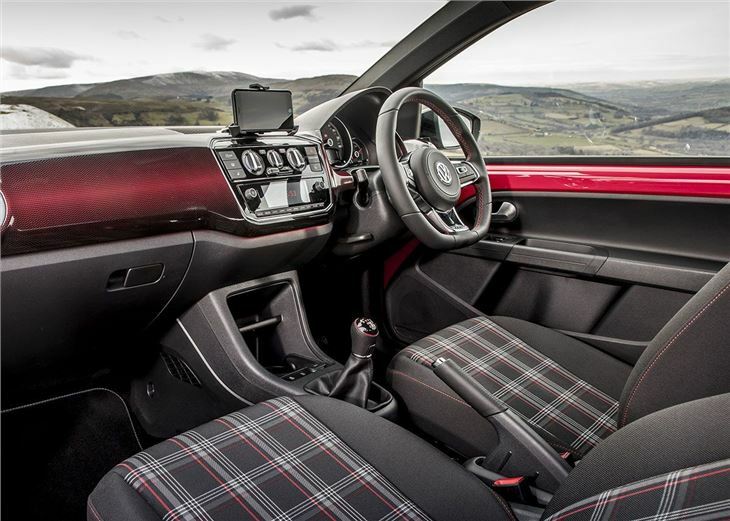 The Up GTI is a worthy addition to the long line of Volkswagen hot hatches, even if it doesn't do quite enough to justify its premium price tag (and insurance rating) over the standard 90PS car; however, even with this criticism in mind, it's difficult to deny that the Up GTI is anything but fantastic fun. Hatch 3Dr 1.0 60 StopStart EU6 Move up! Hatch 5Dr 1.0 60 StopStart EU6 Move up!